What does Gary Allan like about Australia? 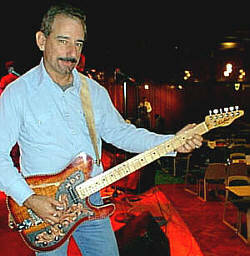 Well, surfing for sure, but also Tomkins Guitars! 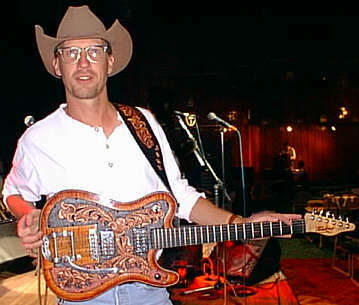 So much so, that Gary and his whole band went home from their last trip 'down under' with a swag full of Tomkins' instruments, including the famous Tomkins Baritone guitar (see below). 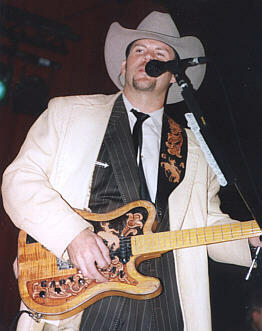 Gary is pictured left with his guitar which has a maple neck, vintage styled with special Gotoh adjustable post tuners. The body is Hoop pine with Tasmanian blackwood cap with binding and purflings. The bridge is the Fishman power bridge and preamp piezo set up. 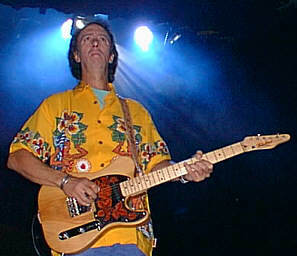 The pick ups are Lawrence vintage single coils. This guitar has a special designed hand carved leather pickguard fitted with contrasting colours. The body is finished in a brown burst nitrocellulose lacquer. Gary Allan and his band wind up their Australian tour with a show at Canterbury-Hurlstone Park RSL Club. 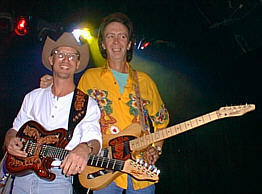 Gary is pictured above, with Allan Tomkins, custom guitar maker. Earlier in the year, Gary and his long-time guitarist Jake Kelly were so impressed with Tomkins Guitars, that they commissioned some new instruments for their return visit. 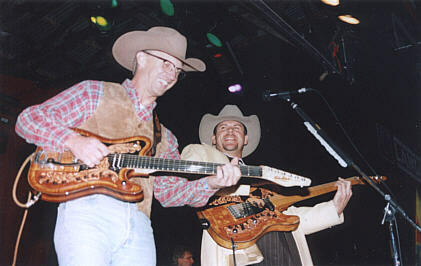 Pictured right: Jake Kelly and Jody Maphis with their new Tomkins guitars. 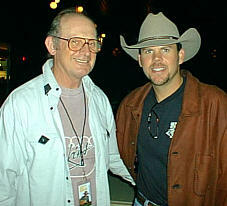 Left: Jake Kelly and Gary Allan. N.B. All the above guitars have bolt on necks with a tapped heel and using special neck screw ferrules which allows easier accessabily to the higher registers.